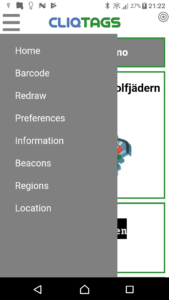 To simplify navigation among the screens and performing actions, a proper drop-down menu has been added and the title bar has been uncluttered in the process. CliqTags Spotter is normally published under private-branding, but the CliqTags-branded version can be obtained for evaluations. Please contact us about access. See CliqTags Spotter for more information.